Welcome back to all our animal lovers and science supporters! We are celebrating 20 years of Tree Frog Treks WILD SCIENCE youth programming. You've helped us reach over 246,000 kids and families in San Francisco since 1999! We continue to look up, down and all around for opportunities to put away the screen and step into the green outdoors! Research proves what we already know- the time we spend outdoors promotes healthy and happy living and creative productivity. This is true for people of all ages, and we’re here to assist children in setting their nature trajectory for the rest of their lives, as their experiences now have a meaningful impact on their adventures later in life. Later, means a well-rounded adult who can cope, adjust and adapt to the technological challenges and climate change puzzles of the 21st century. 1. More BMW: BART, MUNI, Walking: Help us reduce global warming gases. 4. Green plantings: We are offering native plant giveaways for campers to create native habitat in our own city! 5. New Glen Canyon camp – reducing the distance some of our families need to travel to get to camp! We are excited to announce the ways in which your camp tuition supports families, friends and partners of Tree Frog Treks. Our scholarship program aims to award 1 scholarship for every 10 registrations. We fund one full scholarship camper after 10 campers have registered in our efforts to allow all to experience Tree Frog Treks. We don't want to turn anyone away due to lack of funds. 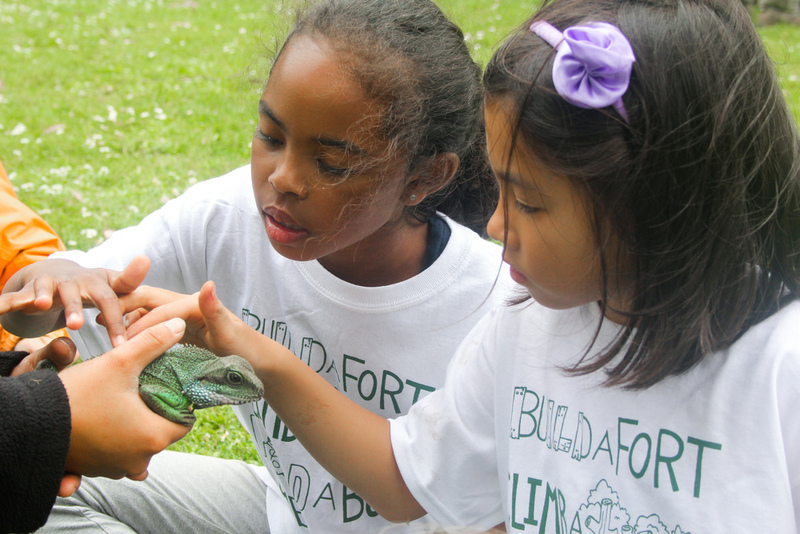 We want to offer SF kids from all over the city a chance to experience TFT camp: “To build a fort, climb a tree, hold a bug and smell the sea”. Thanks for joining us for another amazing summer getting out and getting dirty! During each camp session, campers will meet live animals, perform fun experiments and build leadership and critical thinking skills through adventuring in nature with peers and instructors. Come meet Blondie the Burmese Python, Ivan the African Spur Thigh Tortoise, Squiggles the Asian Water Dragon, and Stickum the White’s Tree Frog - to name some of our nearly 100 Animal Ambassadors! We play games and tell stories to bring many unseen aspects of our urban habitat to life for our campers. We Wander and Wonder Together! Have a question? Check out our Camp FAQs page! We are offering camps at Multiple locations throughout the summer from JUne 5th - August 30th. Please click on a location below to register, or for more information! We also have a Teen Camp & a Counselor in Training Program! Go Straight To Registration Here! It's always free to switch weeks as long as there's space, and we can always hold your fees as a credit if you cancel no later than the Friday prior to camp starting! Check out all the fun we Have!